When we were thinking about important items to buy that golfers may be interested in, we realized that we have talked a lot about different products that are crucial to the game. We have talked about everything from clubs to putters, from golf shoes to stand bags, and we have even included in the mix golf cart tires for good measure. With that, we started to dive into the other items such as nutrition for golfers and the different important piece of gear an individual can use on the golf course such as alignment sticks and more. However, we realized that we have yet to dive into the world of care and grooming. With this next article, we want to share with our audience one of the most important products: leather cleaners. We want to ask you a couple of questions. Are your leather shoes really dirty? Is your stand bag starting to crack? Is the leather of your golf bag very sensitive and needs cleaning? With this, as you will learn, many of these products were designed to not only clean leather but also moisturize. We searched for the best products and we are eager to share them with our audience. Let’s begin with product number one. As the first leather cleaner on our list, we want to share with our audience an expert quality product that excels at being very high quality and of course, effective. We want to discuss with our audience the Leather Honey Leather Conditioner Cleaner and two features to consider this product. This brand has actually been producing this quality product since 1968, making it one of the highest quality cleaners to consider. If you want the softness and smoothness of your leather shoes or bag to last, this is the cleaner to get. In fact, this properly designed cleaner can last six months and longer. This product is designed to penetrate very deep into the pores of the leather to rejuvenate it and soften and promote flexibility. With this, a little bit of the conditioner goes a long way in securing covering the whole surface area of the product you are using it on. One of the best benefits of this item is the fact that it is completely designed to be non-toxic. With this, this product is a non-sticky and odorless conditioner that does not contain any silicone and it happens to also be rain and snow repellent. So, you can condition your golf bags and expect the bag to have this coating for a long period before it needs a reconditioning. If you are seeking on conditioning your golf bags, your leather shoes, or any other leather item, this is the product to get. In fact, this brand offers a 100% satisfaction guarantee alongside the fact that this product is 100% made in the USA. With that said, it has over 4.8k reviews and the product is nearly close to five stars in the review. For the price, you get an 8 FL. OZ bottle that is designed to last for years to come. Penetrates the leather very well. May feel sticky at first. 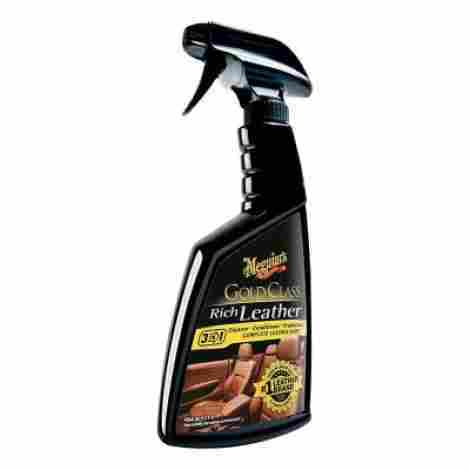 This next leather cleaner is designed for quality and individuals can expect that it actually can be used on multiple different surfaces. If you have a golf bag with different surfaces such as vinyl, compound, faux and other leather, individuals can actually use it on all of these surfaces and expect it to work well. Another great benefit is the fact that it comes as a spray so it can be evenly sprayed on the surface. We want to share the Leather Nova Cleaner. Here are two design features of this product. This product is designed to be very effective and safe to use. In fact, individuals can expect that this product does not have any heavy compounds or metals in it. The overall design of this quality cleaner is safe to use cleaner that evenly distributes the oil to all surfaces and does not leave surface wet spots or another residue. The formula that was used in creating this product is a quality formula that has been around for years. With that in mind, we can say that individuals can easily extend the life of their leather product with this spray. With that, the consistency of the liquid is very high quality and allows for the removable of all debris, marks, or dirt. As far as cost and value, we can say that this formula is very effective and high quality. To add to this, individuals can expect the overall design to be beneficial in cleaning and restoring leather. So, if you want to take out your grandfather’s lucky golf bag and use it on the golf course, you can. 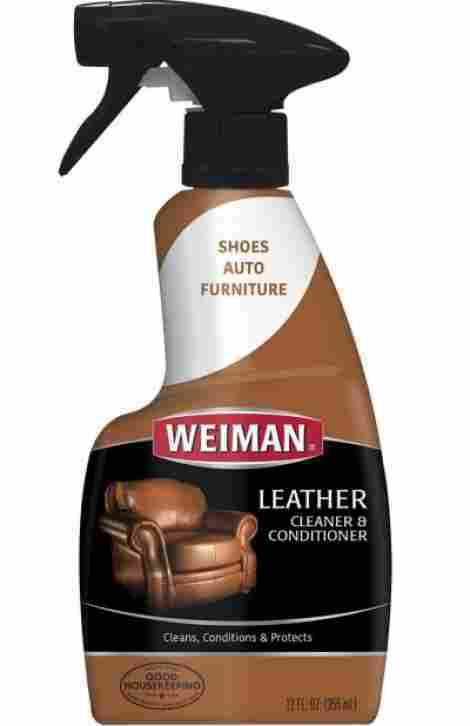 If you want to take out our favorite leather shoes, you can restore them with this spray. Quality and durable blend of materials. Easy to use and spray down. Extend the life of your leather products. Does not remove denim stain. This next product is very different than the first one on the list. The first cleaner from this brand that we shared happens to be a leather conditioner. 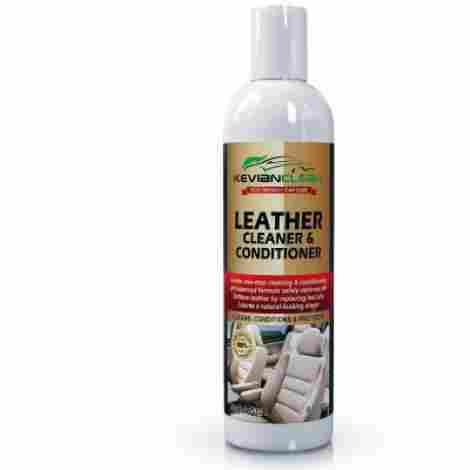 With that, the leather conditioner is designed for individuals that want a quality conditioner that will soften the leather or other surfaces such as vinyl, etc. This product acts as a concentrated cleaner that allows for the cleaning of dirt sports and other debris that leather may attract. 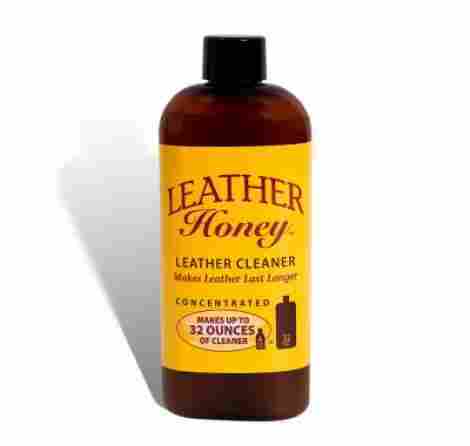 Here are two features of the Leather Honey Cleaner Formula. This item is very easy to use. Simply dilute the formula with a bit of water, all instructions included, and then wipe the area very well. With that, it is designed to remove dirt, oil and other imperfections that leather is attracted to. With this, individuals can clean furniture, handbags, shoes, and golf bags as well. One of the biggest benefits of this product is the fact that it comes with a concentrated formula. The concentrated formula allows for an individual to be able to make the bottle and the contents last for years. In fact, all you have to do is dilute it and go from there. With that, it comes with an unlimited 100% satisfaction guarantee from the brand, which only adds to their reputation. As far as cost and value, as we said above, it is important to note that this is not a conditioner. This is a leather cleaner. With this, the cleaner is designed so individuals can easily be able to clean the products that they need to clean and add longevity to it, even if the item is old. Individuals can expect that this bottle will last a long time. Overall, this product is very high quality and well worth it. Concentrated formula that makes 32-ounces. Perfect for all leather products. We are eager to talk about this brand that offers their leather cleaners as a spray or as a drip bottle. With that in mind, this product has 4.5 stars and almost one thousand reviews. It is a complete cleaner that is even pH balanced for effective and easy cleaning that ensures the preservation of all leather products that you have in your home. With that, this product is high quality, durable, and built to last. Let’s begin the features. This product is designed with pore penetration. Essentially, the design allows for the leather to lift dirt and debris up from the pores and remove it. With this, individuals can expect the liquid to preserve the leather and close the pores, creating a more quality and soft surface on the leather. This product is designed with a leather cleaner spray and a leather conditioner. The spray allows individuals to clean the surface well and be able to easily remove all dirt from the surface. The second item is the conditioner. The conditioner allows individuals to be able to soften the leather easily and from there, be able to expand the livelihood and longevity of the leather surface. As far as cost and value, we can say that this is one of the highest-grade leather cleaners in the industry. The reason being is because this brand is trusted, high quality, and very effective. To add to this, they have designed some of the highest quality products for the price. This two-piece set is priced under what a single cleaner costs from multiple companies. With that, we highly recommend it. Quality product that is made to last. Easily wipes away contaminants. pH balanced. Comes as a two-piece set. The conditioner does not soften a lot. As the next product on our list, this happens to be one of the most inexpensive options we want to share. However, do not let the low price deter you away from considering this product. We want to share the Meguirs G10916 Golf Class Rich Leather Cleaner and two features individuals can expect from this product. It has an easy to spray design, it cleans and conditions. What more could you want? How about these two benefits? This product has a very high-quality formula. We have come to know that aloe is one of the highest quality plants and ingredients in many of the products we have today. Aloe is known to nourish the skin and protect the skin. With that, this item actually has aloe in the formula, which deeply conditions the leather and conveniently nourishes it so it can withstand the test of time. One of the most important aspects to consider this formula is the fact that it is a non-whitening and non-greasy formula. With this, individuals can expect the formula to be very high quality and not damage the surface of the product but enhance it. Alongside this, it prevents premature wear and tear, drying, and fading. It also removes dirt and grime but prevents UV damage that may occur to your golf bag or shoes. To discuss cost and value, we want to say that this product is very great if you are considering a cost friendly and effective spray. It also does condition, so individuals can expect the leather to be very soft and feel refreshed and brand new. With that, the price is less than ten dollars and it comes in a convenient spray formula that gently and effective restores all leather products and items. Quality formula that is non-greasy. Leaves leather shiny and clean. Does not clean as effectively as one would like. As the next product to share, we want to talk about the quality one step cleaning leather cleaner that is this formula. This product comes with a quality one-time wipe cleaning and conditioning formula that is high quality, well designed, and intended for detailing, upholstery and more. With that in mind, we want to share the KEvianClean Leather Cleaner and what individuals can expect as far as the formula and consistency. This item is designed to not leave an oily mess behind. With that said, it is designed to not leave streaks or residue on any of your clothing in the case that you use it on your car seats or couch. If you use it on your golf bag or shoes, you can expect that it will penetrate well and deep into the leather fibers of the bag and the shoes. This cleaner is designed to be chemical free, organic, non-toxic and pet safe. With this, an individual can expect that this formula is one of the eco-friendliest formulae in the industry and it is very safe on the hands and gentle to use. Overall, it is a high quality and well-designed formula to consider. To discuss cost and value, this product is very high quality and it actually even comes in two different sizes to choose from. It also comes with a 60-money back guarantee. However, it has close to five stars so we don’t you will be returning it. For the quality and overall design and the fact that it is eco-friendly and child and pet-friendly, we think this is the formula to beat so far. High quality formula to consider. No streaks and oily residue. •	Gentle on the hands. Does not leave a shine. May take multiple tries to remove stains. As the seventh product we want to share, this next leather conditioner is a quality product for individuals that want deep penetrating formula alongside the benefits of a revitalizing formula. 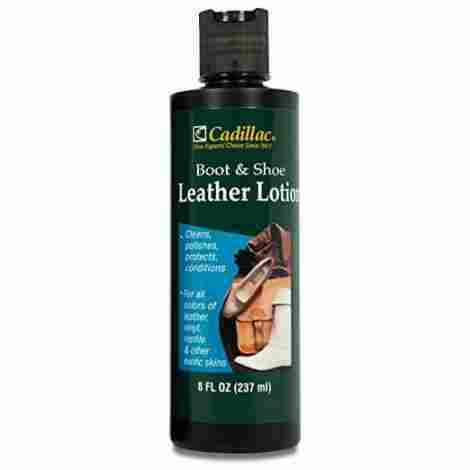 We want to share with our audience the Cadillac Boot Shoe and Leather Conditioner and what individuals can expect as far as quality when it comes to this high-quality conditioner. The design of this product acts as a leather formula that is very easy to use. With that, it is more of a lotion that you use to clean and condition your leather items. To add to this, the lotion is designed to polish and protect your leather goods from wear and tear, leaving a satin-like and soft finish. With this, it has no sticky residue and the lotion will not rub off on your skin or your clothing. This formula is very easy to apply. However, the best benefit is that it actually is designed to prevent cracking or water damage. With this, it may easily be used on all leathers, reptiles, patents, vinyl, and even exotic skins, which is common among luxury golf bags and shoes. Overall, the formula not only restores, but it also protects. To discuss cost and value, we can say that this formula is very high quality and offers a great solution to old leather products that need a bit of touching up. The price is also very fair and the overall formula quality is non-sticky and designed to be tax-free as well. You can polish, restore, and refresh all of your leather goods with this product and leave a satin-like finish on all of your items. Great amount for many products. Can heal exotic skins and real leather. Do not use on lamb. We want to share another quality leather cleaner that is designed for individuals that want a quality product that will fix and enhance your leather. Designed to prevent cracking and fading, we want to share a product that is effective in cleaning and conditioning your leather shoes or cracked golf bag. Here are two features of the expert and quality Weiman cleaner. This brand happens to be one of the most trusted in the industry, they have a reputation for creating and designing a large list of products that are built to last. As far as this cleaner, this is an advanced protection formula for all leather items. The formula even comes with a natural conditioner system and a pH balance that ensures the restoring of the natural suppleness and sheen of leather. This item is designed with a restore and protect formula design that guarantees individuals will be able to bring their leather back to the glory days. This product is designed with a UV protectant formula that allows for individuals to enhance their leather, clean it well, and also protect it against fading or damage from the sun. The leather is also designed to not leave any streaky residue behind. As far as cost and value, we want to share with our audience that this formula is an expert formula and very well crafted to be easy to clean and easy to maintain. The fact that it contains UV resistance and restoring properties to enhance the quality, this formula is an expert formula to consider. Overall, we highly recommend it if you want quality and a trusted brand with years of experience. Works on all finished leather. Protects your shoes and golf bags. The bottle does not close well. May get dried out easily. As the next set on our list, we want to share a quality cleaning set that has everything an individual will need to clean their leather items very well. It comes with an applicator sponge, the cleaner, and the conditioner as well. With that said, we want to share with our audience that this product is very effective, durable, and designed to last. 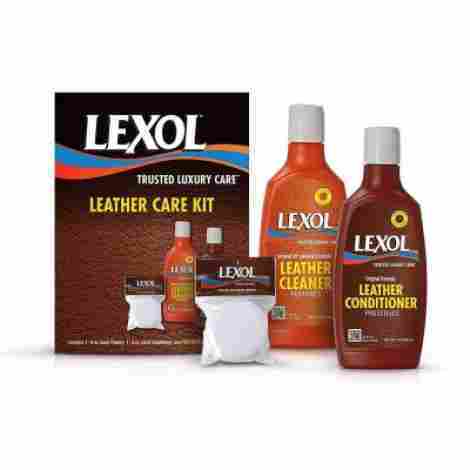 This is the Lexol Leather Kit. This product is designed with a pH-Balance leather cleaner design. The cleaner is a pH balanced formula that is very high quality and comes with no additives, silicones, or alcohols. To add to this, it also comes with no waxes, oil, or other ingredients that will fear with the integrity of the product. Individuals can expect the formula to be a natural formula that is effective and high quality. This brand acknowledges the importance of not only having the right cleaner but also having the right applicator. This brand includes a non-abrasive microfiber sponge with the purchase of their kit, which is designed to keep all surfaces safe and not damages any of the leather. With this, individuals can expect the combination of the cleaner and the sponge to work very well. To discuss cost and value, we want to share with our audience that this is an excellent formula and kit for individuals that want to buy the whole package. With this, the design is an intentional and high-quality design that includes everything an individual will need to enhance the quality of their leather product. For the kit, it has 4.5 stars and it comes under twenty dollars, so that is a great deal. Quality cleaner that non-greasy and contains no harmful silicon. •	Pack of 2 non-abrasive sponges. As the last product on our list, the best benefit of this item is that we have not talked about it yet. 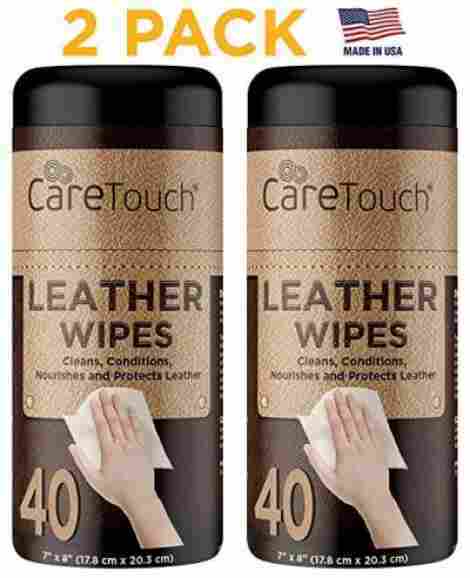 We want to share with our audience the high quality and effective Care Touch Leather Wipe. This product is a high quality and durable wipe that is disposable after use. With a count of forty per pack, individuals can expect them to clean, condition, and protect your leather from wear and tear. If you want to protect your surfaces very well, this is the product to get. Individuals can expect that this item blocks out UV rays and ensures that your leather is exposed to minimal wear and tear. From this, it also allows for the enhancement of the leather by removing much of the wear and tears it may have experienced. Now, this is the most unique aspect of this cleaner. Many cleaners that we have talked about do not have a scent at all. This item is actually infused with a scent that leaves the surfaces of whatever you are cleaning smelling very light and fresh. With that in mind, we can say that the scent is high quality and smells very nice, without adding an oily and greasy feel to the leather. As far as cost and value, this item is about the average price that one would pay for a spray. Considering that it comes with forty wipes, individuals are opting in for a value pack that is well designed and effective. Overall, we want to mention that this leather cleaner is very high quality and the wipes are also sensitive on the skin. If you want the comfort of disposable wipes, this is the product to get. Not very good at cleaning. Not cost-effective if you consider a spray or liquid. Wow, we did it! Now, it is important to ask yourself exactly what you want to use this product for. The reason being is that there are different cleaners for different scenarios. For instance, there are cleaners that are designed to clean shoes, faux materials, and there are even cleaners that are more as wipes to clean dirty or debris. With this in mind, it is important to note exactly which product is the best for you. So, let’s begin with the criteria used for evaluation to better help you narrow down your product choice. First, the most important thing to keep in mind is the purpose. Essentially, what is the cleaner going to be used for and what material is it intended for. We want to share the most common that we found. So, there is a wide variety of this product and the most common is for faux materials. This type of cleaner is intended for everything from shoes to handbags, sandbags and more. This type of product at times may have a bit of flexibility and it can be used for other materials as well. What does it do? Essentially, it helps restore and protect the material from wear and tear, UV rays, and essentially cleans up the leather, enhances the porous material and makes it look newer than before. There are real leather products as well. This type of cleaner is primarily intended for real leather and is more high quality, often waxier, and is designed to be more durable and effective than other cleaners. With that in mind, it is important to know the difference so you purchase the right kind..
Now that we have covered what material surfaces these products will do well on, let’s explore the different type of ways an individual can treat their footwear. There is a wide variety of different wax cleaners or gel cleaners. These are meant to be used with different towels or a brush. For instance, some brands even include their own foam pad or microfiber towel to aid in the cleaning process. This is one of the most common types in the industry. There are leather cleaner wipes. We often see this in stores and the wipes work to be disposable. However, they do not last as long as the gel or the wax. With that, they tend to also be scented and leave more of a residue than other cleaners. This is also another leather cleaner. There is a common variety of different sprays in the industry. With that, sprays tend to be a bit more liquid and often times can leave a shiny sheen on the material. Therefore, it is important to ensure that the liquid is of the best quality. Now that we have talked about the purpose and different types, we want to share the common benefits of a leather cleaner. When taking into consideration a specific type of product, it is important to look into the benefits of that item. For instance, there is a wide variety of cleaners that are designed specifically for shoes, bags, or apparel. However, there are cleaners intended to protect and restore broken leather. So, it is wise to investigate all these design benefits. Here are different benefits and features to look out for. Restores and repairs cracked leather. Protects the leather from further wear and tear. Opens pores and keep leather firm. With that in mind, here are some of the most common benefits. 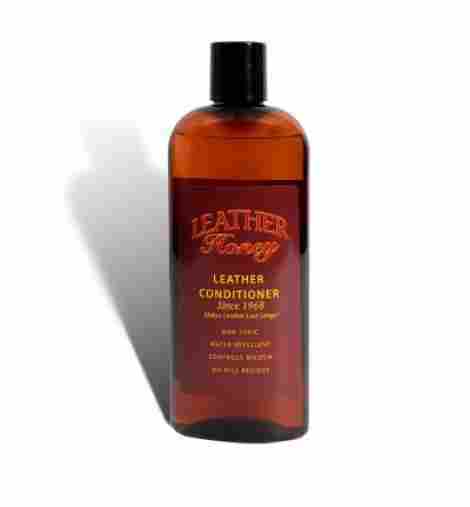 Now, when taking into consideration the most common leather cleaners, individuals will come across conditioners as well. So, we want to move forward and discuss the difference between the two. Cleaners are designed for the intent of cleaning, removing, and enhancing the physical appearance of the product. A cleaner is what you want to use if you want to remove dirt, stains, water damage, etc. With that, a quality cleaner will not leave behind residue, will not have a chemical odor, and often times is made to be organic. A conditioner is very different than a cleaner. A conditioner is designed to soften the material, repair and restore the overall product. Individuals can look at this kind of like waxing a car. Waxing ensures the car is in the best condition and protects the paint from future damage. With that said, when picking out a quality cleaner, brands offer a wide variety and they either come by themselves or in packages. Now, we want to move forward and answer some of the most frequently asked questions. Q: Do I need to clean the leather with water and a rag first? A: This is one of the most asked questions and often times the answer is no. Actually, all you want to do before you start cleaning your leather product is wipe down all of the dust or any dirt and tiny rocks that may scratch or damage the leather during the cleaning process. Q: Do I need conditioner? A: The conditioner is not necessary, but if you want to restore and protect the product more than just cleaning it, a conditioner is often advised. Q: What kind of towel do I use? A: If you are going to be cleaning your own leather, a quality and clean towel are recommended. With that said, there are specific towels for cleaning this kind of material. The brand may also include a cleaning towel or sponge with the kit. Q: How often do I need to condition? A: This is a great question and often times, the brand will include the instructions. However, most often it is at least every two weeks until the product is restored to new.